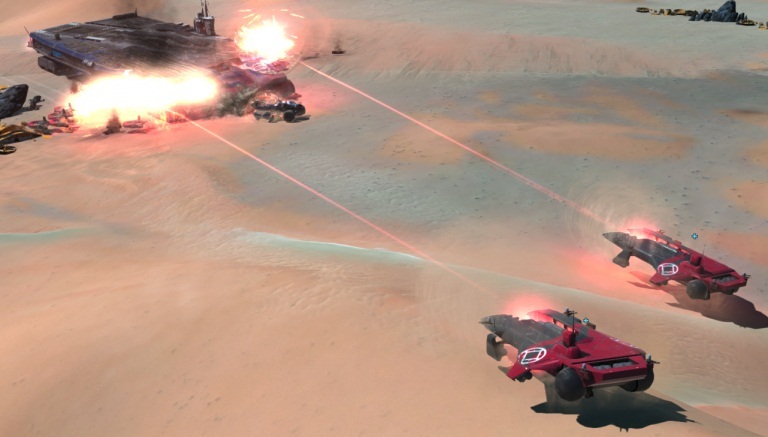 Before we publish an official review of the game, we have to add some updates about the Deserts of Kharak that got out today. As you probably already know, 4 hours ago the Homeworld DOK went live, and yes we are thrilled about the game more then we thought that we would be. I mean it’s really awesome. Before we start sharing recent art and other cool info, you should probably know that the new official launch trailer is up! And it is by far the best one yet. Let’s check it out together. As promised, the good guys from BBI also provided us with some brand new insights about the game designs which should be very helpful in our gameplay tactics. In this blog entry, we have the opportunity to check out the Gaalsien Faction. Everything from the Gaalsien fleet to the Honorguard Cruiser is presented and explained in details, and how this vehicles differentiate from the Coalition Faction in their design is best presented in the following quote. Any given engagement will remind the player: the Gaalsien live in the deep desert, the Coalition are merely visiting. It gets even better. A little piece of info for avid HW fans, the official soundtrack just dropped on Steam. For me, the Homeworld franchise without the epic music of Paul Ruskay simply wouldn’t be the same thing. I am glad to see this man behind the sound of DOK. Not just because I remember his original award winning HW soundtrack, but I have to admit that that “detail” provides the experience that will remain undisputed: it’s simply the sound of Homeworld. Any other music couldn’t provide that exact atmosphere, even if someone would’ve tried to mimic Paul Ruskay’s work, it wouldn’t be the same thing. Although this isn’t the same thing, far from it, it is just the same experience. Go buy it! I would love to keep this community going, so if there are some fans that would love to review Homeworld, or any of the games that we got here, feel free to do so. And if there is a fan that would like to contribute to the site you can reach us here.